In course of his incomparable record as a one-day batsman, Sachin Ramesh Tendulkar has unfurled many a memorable innings; but few as impressive and invaluable as the one in Sunday’s first Commonwealth Bank Series final. Sachin Tendulkar, who defied pain to score his first one-day century in Australia in his 18-year career, rated his effort "highly" but said he did not want to prove anyone wrong. Australian skipper Ricky Ponting today asked his batsmen to take a leaf out of Sachin Tendulkar's masterclass at the SCG if they want to beat India in the second cricket tri-series finals in Brisbane on Tuesday. Residents of this city danced with joy today after the Indian u-19 cricket team won the World Cup. As soon as India beat South Africa in the final, the family of the team’s opening batsman Taruvar Kohli were flooded with congratulatory phone calls. India tonight erupted with joy after its under-19 cricket team won the World Cup, as President Pratibha Patil, Prime Minister Manmohan Singh and the cricket board hailed the achievement as a "great moment" for Indian cricket. Prabhjot Singh struck three goals as India opened their campaign in the World Hockey Olympic qualifying tournament with an emphatic 8-0 win over Russia here. Prabhjot, who has been in tremendous form in the past one year, did the star turn for the Indians scoring three goals (19th, 29th, 65th), while Dilip Tirkey (14th), Shivendra Singh (30th) Tushar Khandekar (36th), Sardara Singh (48th) and V Ramachandra Raghunath (54th) shot home once each at the Prince of Wales Country Club. New Zealand’s Mark Brown clinched a three-shot victory in the Johnnie Walker Classic today, claiming his second title in successive weeks. The Wellington player capped a sensational run of success with a final round five-under par 67, a week after he had won his maiden international title by claiming the Asian Tour’s SAIL Open. Elena Dementieva produced a major surprise when she captured the ninth title of her career with a victory over her Russian compatriot Svetlana Kuznetsova in the Dubai Open. Not only did Dementieva overcome a strong favourite, the second seeded former US Open champion, but achieved her triumph as an unseeded player in a field containing almost every leading woman in the game. World No 4 Jelena Jankovic of Serbia was given top billing, followed by Williams sisters- Venus and Serena in the $600,000 WTA Tier II Bangalore Open, which begins at Signature Kingfisher Karnataka State Lawn Tennis Court here tomorrow. Patty Schnyder of Switzerland, ranked 12th in the world, was seeded fourth followed by Agnes Szavay of Hungary, Sybille Bammer of Austria, Vera Zvonareva of Russia and Maria Kirlenko of Russia. World Champion Viswanathan Anand drew with his nearest rival Magnus Carlsen of Norway to maintain his slender lead at the end of the 10th round of the Morelia-Linares tournament underway here. In order to reward players for being loyal and not getting influenced by the lucrative deals around, New Zealand Cricket has (NZC) decided to hand out significant pay increases to its 20 centrally contracted players. India registered their first ever win in a final of a triangular series in Australia. They had lost their previous six finals. In his farewell tour of Australia, the Mumbai magician scored a peerless, unconquered 117 in 120 balls; and this, most importantly, carried India to a comfortable six wicket victory over Australia - with 4.1 overs to spare - and a 1-0 lead in a best-of-three finals. A quintessentially hard-hitting 82 from Mathew Hayden and his partnership of 100 for the 4th wicket with Andrew Symonds, in a splendid counter attack, boosted Australia to 239 for seven; but to no avail. It was Tendulkar’s maiden limited overs century Down Under in 39 appearances. But from the moment he negotiated the first ball, he looked in pristine form. His footwork was flawless, his judgement of length impeccable. His defence was impenetrable and his improvisation and timing outstanding. He made his intentions clear early with a flashing square cut off Nathan Braken - one of his 10 boundaries. Brett Lee was worked away with finesse off the pads. Mitchell Johnson finished with figures of none for 70, twice humiliated by inventive wafts over the wicket-keeper’s head. James Hopes was dismissed through the covers; Brad Hogg treated with contempt. But Australia hit back with Herculean fielding. Robin Uthappa was sent packing by catch at deep square leg, literally a few centimetres off the ground; and Hopes shattered the stumps at the non-strikers end to run out Gautam Gambhir, who had turned sluggishly for a second run. Sadly, Tendulkar’s aggressive running between the wickets aggravated a groin strain. He has just 36 hours to recover before the second final. After Yuvraj Singh fell cheaply - failing to pick a slider from Brad Hogg - the pupil, Rohit Sharma joined the master, Tendulkar. Notwithstanding a few half-chances, a 123-run stand between the pair irreversibly turned the tide from 87 for three. Rohit’s 87-ball 66 was embellished with stirring straight drives and electrifying pulls. He was eventually bowled by a ball of perfect length from Hopes. A capacity crowd mushroomed at the historic Sydney Cricket Ground - where India had never won an ODI in 11 outings. A sizeable Indian presence struck up a drum beat akin to celebrating Durga Puja. To add to the buzz, the Indians threw Piyush Chawla into the mix. The 19-year-old Uttar Pradesh leg spnner did not capture a wicket; but conceded only 33 runs in his 10 overs. He also took a brilliant catch at deep square leg to terminate danger-man Hayden’s innings off Harbhajan Singh. Umpire Daryl Harper let off Hayden by not referring an appeal for a stumping to his TV colleague when Australia were 69 for three. The burly left-hander, otherwise, bludgeoned the ball straight past Praveen Kumar and walked down the wicket to belt him to midwicket. He was even more severe on Irfan Pathan, twice extracting three fours in an over off him. Ultimately, he top edged a sweep. Previously, Harbhajan had deceived his other bête-noir, Andrew Symonds in the air to have him consumed at midwicket. Harbhajan and Chawla, bowling in tandem, dried up the boundaries. But Symonds characteristically lofted one back to the long off fence with minimal back-lift before failing to convert a cameo into a stellar contribution. Adam Gilchrist mistimed a pull to mid-on. This stroke was also Ricky Ponting’s undoing. The beneficiary in both cases was Kumar, a character right out of Lagaan, a medium pacer with a whipping wrist action and it would appear a golden arm! Ishant completed the early demolition - knocking down Australia to 24 for three - by winning an appeal for a catch at the wicket when the ball actually clipped the top of Michael Clarke’s front pad. The outfield generated awkward bounces, which provoked mis-fields. But the Indian ground-fielding was appalling. Fall of wicket: 1-16, 2-19, 3-24, 4-124, 5-135, 6-173, 7-212, 8-231. Bowling: Praveen Kumar 10-1-49-2, Ishant Sharma 8-0-32-1, Pathan 7-0-63-1, Harbhajan 10-0-38-2, Chawla 10-0-33-0, Yuvraj Singh 4-0-18-1, Rohit 1-0-5-0. Fall of wickets: 1-50, 2-56, 3-87, 4-210. Bowling: Lee 9-0-33-0, Bracken 8-0-42-0, Johnson 10-0-70-0, Hopes 8.5-0-42-2, Hogg 7-0-38-1, M Clarke 3-0-11-0. Tendulkar remained unconquered after scoring 117 which helped India to take a 1-0 lead in the best-of-three finals, setting platform for their first-ever one-day cricket tri-series win Down Under. "In the last series, I missed a few centuries. I was also struggling with a groin strain for some time. But these things are part and parcel of the game and one has to carry on. I rate this hundred very highly," Tendulkar said after guiding India to a six-wicket victory. Tendulkar's less than stellar one-day record while chasing in recent times had set some tongues wagging but the batsman said he was not aiming to prove anyone wrong. "I play the game for passion and love. People have been writing all sorts of things and I don't want to prove anybody wrong," he insisted. Tendulkar also said he was happy about his long stay in the middle today as planned. "It was wonderful to end on a winning note and be there when victory was achieved. The century was secondary. The next match (in Brisbane on Tuesday) is very important now," said the master batsman, who may be playing his last ODI series in Australia. The 34-year-old cricketer agreed that he wanted to get his first one-day hundred in Australia but felt victory in the first final made it a secondary objective. "I wanted to get the hundred today. We had never beaten Australia in Sydney, and there was no better occasion than today to change that," Tendulkar said. "I would like our batsmen to take a look at how he (Tendulkar) built an innings. He had a few close shaves to start with but once he got through the new ball, he upped the tempo of his innings and controlled the game beautifully," said a subdued Ponting after his side's six-wicket defeat. "Tendulkar sums up a game situation very well, that's something we would require our batsmen to do and go for big knocks when set." Ponting said Tendulkar appeared to plan ahead of what his team was trying to do against him. "He has some sort of plan what we are trying to do. We have to think one step ahead of him," he said. Ponting also didn't lose sight of young Rohit Sharma, the other Indian batting star of the night. "He played very well. He rotated the strike nicely and kept the scoreboard ticking over. He looks pretty calm and controlled. His stand with Tendulkar was one of the big moments of the game," he said. Ponting conceded that the visitors had their nose in front of them and his team would have to lift themselves in all departments of the game in the next match at the Gabba. "In that Melbourne game (on February 29) I thought we were switched off. We were too excited to plan for finals. But today, we didn't do a good job with bat, ball or in the field. The road leading to Taruvar's home were strewn with flowers and people burst crackers and a ‘dholi’ kept everybody entertained. Speaking to The Tribune, an extremely jubilant Sushil Kumar, father of Taruvar, said, "It is a moment of pride not only for our family but also for the nation. This victory will be a big launching pad for these talented cricketers and it will motivate others as well. I am happy that Taruvar’s hard work has paid rich dividends". On being asked about the sum of Rs 15 lakh announced by the BCCI for every player, Sushil said the decision will further encourage the players. One of the finest u-19 batsmen in the country, Taruvar has scored an impressive 217 runs in five matches. The junior team had earlier won the U-19 Cricket World Cup in 2000. Taruvar’s family is one of Jalandhar’s biggest sports goods manufacturers and produce sports shoes, hockey sticks and cricket bats under the brand names of Tracer and Beat All Sports (BAS). India's victory at Kuala Lumpur for the second time in eight years capped a super Sunday after the senior team beat Australia in the first of the three matches in the tri-series finals a few hours earlier making it a double whammy for cricket lovers. Congratulating the victorious team, Patil said the team "showed consistency and its class throughout." 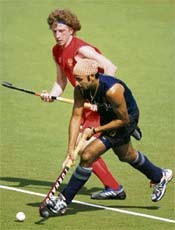 Prime Minister Manmohan Singh said it was a "handsome victory" for India. Homes of several of the triumphant cricketers in Lucknow, Jalandahar and a few other cities broke into spontaneous celebrations and scenes of wild jubilation were witnessed as their relatives did an impromptu jig. BCCI President Sharad Pawar, who announced a Rs 15 lakh cash award for each of the winning members, said the future of the Indian cricket is bright. "The team has done a great job, have demonstrated there is a lot of potential in young players and that the future of Indian cricket is bright." Lalchand Rajput, Indian cricket manager and a former under-19 coach, said from Australia the Seniors are proud of of the achievements of the youngsters. "It is a great moment for Indian cricket," he said. Dilip Vengsarkar, Chairman of the BCCI selection committee, said the "tremendous " victory augured well for the future of the Indian cricket. "Today is one of the greats days for Indian cricket. We beat Australia in the first of the best-of-three One-day tri-series finals at Sydney and the Under-19 team triumphed in the World Cup in Malaysia," said Vengsarkar, who is also a former Test captain Vengsarkar. "I would like to point out (coach) Dave Whatmore's role in the triumph. It was a great choice by the National Cricket Academy committee to send him as the coach. He's played a very important role in the victory," Vengsarkar said. Two other former Test captains, Ajit Wadekar and Chandu Borde, were also elated by the show of the two teams. "This is really a Super Sunday, with victories at Sydney and Kuala Lumpur. It's a great day for Indian cricket. The youngsters have been superb. Now we have a second string of players to take over from the seniors when the time comes. Wadekar also gave credit to the Indian Under-19 team and coach Whatmore. "The coach does play quite a significant role as is accepted now," he said. Prabhjot Singh struck three goals as India opened their campaign in the World Hockey Olympic qualifying tournament with an emphatic 8-0 win over Russia here. Prabhjot, who has been in tremendous form in the past one year, did the star turn for the Indians scoring three goals (19th, 29th, 65th), while Dilip Tirkey (14th), Shivendra Singh (30th) Tushar Khandekar (36th), Sardara Singh (48th) and V Ramachandra Raghunath (54th) shot home once each at the Prince of Wales Country Club. Chief coach Joaquim Carvalho expressed satisfaction at the outcome and said the victory was a confidence booster for the players. "It is always good to start a tournament on a victorious note, no matter what the opposition is. We were keen to pick up three points against Russia and am quite happy that we were successful in meeting our target today," Carvalho said. He admitted to feeling relieved at having the opening game done. New Zealand’s Mark Brown clinched a three-shot victory in the Johnnie Walker Classic today, claiming his second title in successive weeks. The Wellington player capped a sensational run of success with a final round five-under par 67, a week after he had won his maiden international title by claiming the Asian Tour’s SAIL Open. The 33-year-old, tied second overnight a shot behind Japanese leader Taichiro Kiyota, charged through the back nine with five birdies, four of them in a row. He took the lead on the 15th hole before sealing victory with a birdie on the 18th, lifting both arms in celebration. Brown’s triumph aggregating 18-under par 270 fetched him a winner’s purse of $409,743 and the European Tour playing exemption. Overnight leader Kiyota, paired with Brown, led on his own and then was tied at the top with Australia’s Scott Strange but both crumbled under pressure to finish tied second with Greg Chalmers of Australia. Kiyota carded 71 while Strange (68) and Chalmers (68) could also not produce the finish, the trio aggregating 15-under par 273 at the par-72 DLF Golf and Country Club near New Delhi. Strange’s hopes evaporated after a bogey six on the final 18th hole where he hit the fairway bunker and then overshot the green and rolled past the cart path. Britain’s Graeme Storm, Swede Johan Edfors and India’s Shiv Kapur were joint fifth a further shot adrift. Brown’s victory was as unexpected as that of last year’s winner Anton Haig of South Africa in the event co-sanctioned by the Europe, Asia and Australasia tours. Paired with Kiyota on the final day, Brown had an uneventful front nine where his two birdies were wiped out by two bogeys. However, he was simply unstoppable on the return trip despite Kiyota’s game crumbling in front of him, particularly his putting. Strange’s final hole misses and Kiyota’s bogey five on the 17th all but secured Brown the title. He still had a heart-stopping moment when his second shot on the 18th hole bounced on the edge of the water hazard and rolled kindly to about 15 feet off the pin. Elena Dementieva produced a major surprise when she captured the ninth title of her career with a victory over her Russian compatriot Svetlana Kuznetsova in the Dubai Open. Not only did Dementieva overcome a strong favourite, the second seeded former US Open champion, but achieved her triumph as an unseeded player in a field containing almost every leading woman in the game. It was Dementieva's first visit to the money-laden Gulf tournament and she surprised herself with an instant success which suggested that the 26-year-old from Moscow has recovered from the rib injury which kept her out for nine weeks last year and can work her way back up the world's top ten. "Now I realise how good I can be on the court," she said. Her win, she said, was for her mother, Vera. "All I have done in my life - it's for her," Dementieva said. World No 4 Jelena Jankovic of Serbia was given top billing, followed by Williams sisters- Venus and Serena in the $600,000 WTA Tier II Bangalore Open, which begins at Signature Kingfisher Karnataka State Lawn Tennis Court here tomorrow. Patty Schnyder of Switzerland, ranked 12th in the world, was seeded fourth followed by Agnes Szavay of Hungary, Sybille Bammer of Austria, Vera Zvonareva of Russia and Maria Kirlenko of Russia. Jelena, who enjoyed a breakthrough season in 2007 and notched her first top 10 finish with four titles, got a bye in the first round. She will take on winners of the first round clash between Yung-Jan Chan of Taipie and Sanda Mamic of Crotia. Both the Williams sisters, the multiple grand slam winners, got bye in the first round of the main draw. While Venus will take on winners of Anne Kremer of Luxumberg and Shui Peng of China, Serena will meet winner of Tzipora Obziler of Israel and a qualifier. Defending Champion Yaroslave Shvedova of Russia will clash with Akgul Amanmuradova of Uzibikstan in the first round of the main draw. The most disappointing part of the mega tournament was absence of Indian tennis sensation Sania Mirza, who opted out after being involved in many 'controversies'. India born Shikha Uberio, who has been given wild card entry to main draw, will clash with promising Hungarian Agnes Szavay in her first round, while another Indian wild card entrant Isha Lakhani will meet a qualifier. Qualifying rounds are under progress and Sunitha Rao has entered the final round of qualifier and was just one win away from making it to the main draw. Tournament Director and KSLTA Honourable Secretary Sunder Raju told UNI that the ground was re-laid at a cost of about Rs 1.6 crore to meet the Tier-II tournament requirements as specified by WTA. In the Doubles, the Taipei pair of Yung-Jan Chan and Chia-Jung Chuang, ranked 19, were top seeded. While Chinese pair Yan Zi and Jie Zheng (35) were seeded second, another Chinese pair Shuai Peng and Tiantian Sun (52) and Russian pair Anastasia Rodionova and Yaroslava Shvedova (135) were seeded third and fourth respectively. Anand took his tally to 6.5 points to be half-a-point ahead of the Norwegian teenager while draw was the order of the day as none of the four games produced a decisive result in the keenly contested tournament. Grandmaster Levon Aronian of Armenia remained in the third place with a draw against Teimour Radjabov, while Veselin Topalov managed to retain his fourth place by drawing against Vassily Ivanchuk from an inferior position. Hungarian Grandmaster Peter Leko showed some signs of recovery from his poor form by confidently drawing against Alexei Shirov with the black pieces. Anand decided to play solidly against Carlsen and chose a positional line against the Sveshnikov variation of the Sicilian defence. Carlsen managed to generate the kind of play which is characteristic of the variation and a level position arose from the opening. Along with the centrally contracted players, 72 semi-professionals playing their trade for the major associations will also get a major boost in their pay cheques amounting to a 40 per cent hike.